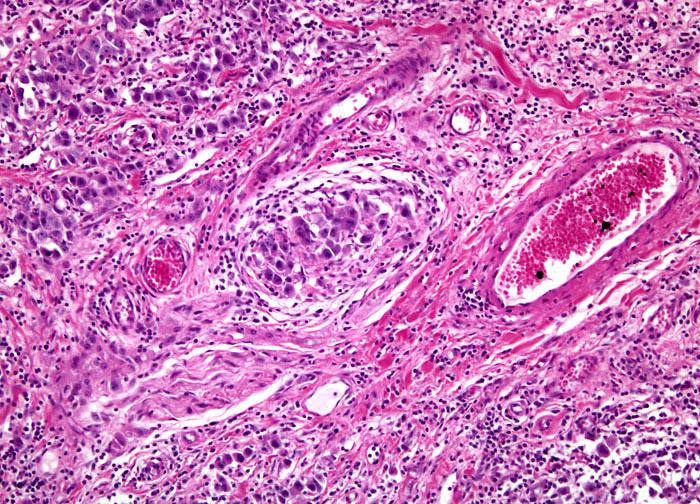 Seminoma tumors are usually first noticed accidentally or through self-examination. The growths typically manifest themselves as a lump in one of the testicles, often without any other symptoms of their existence. Sometimes the tumors may result in pain in the testicles, groin, or lower abdomen or a feeling of heaviness or fluid-accumulation in the scrotum. In very rare instances, systemic symptoms may develop due to metastases in the liver, lungs, bone, or other parts of the body. Unlike nonseminoma testicular tumors, however, seminomas have a propensity for remaining localized or to spread only to nearby lymph nodes. Approximately 85 percent of seminoma tumors are confined to the testes when they are diagnosed.